After three days of touring around central Texas eating BBQ and food from trucks, it was finally time for le pièce de résistance! 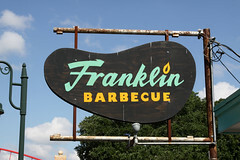 Another trip to Franklin Barbecue! The first is that the lines are, if anything, quite a bit longer. This year, we got organized at the hotel and all headed over to Franklin, arriving 30 minutes before they they opened (on a Sunday…. 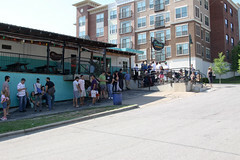 ), and the line was all the way down the block… Indeed, at T-30, I’m pretty sure that the people at the end of the line were going to find themselves getting… coleslaw. But we were able to do all of these, so we managed to walk in at 10:30 and walk out with a giant box loaded with two briskets, another tray that the friendly folks inside told us was burnt brisket ends, but was actually random extra cuttings of pulled pork, and enough onions, pickles, bread, sauces, etc to really make a picnic. We headed two blocks up the hill to a nice neighborhood park to enjoy our feast. How was the meat? Perfect. Like last year, the bark was dark and crusty, but also spicy and flavorful with a nice pepper tang. 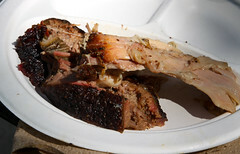 The meat was seriously tender, especially the few slices we had from the fatty end pulling apart into a light lace as you tugged at them. It was juicy. And unlike last year, there was more than enough to satisfy everyone. So, if you really want to do the Franklin thing, and can’t deal with the whole line issue (jeebus, I think some of those people were camping out like it was a Phish concert…), grab some friends, a credit card, and the phone, and preorder yourself some meat!